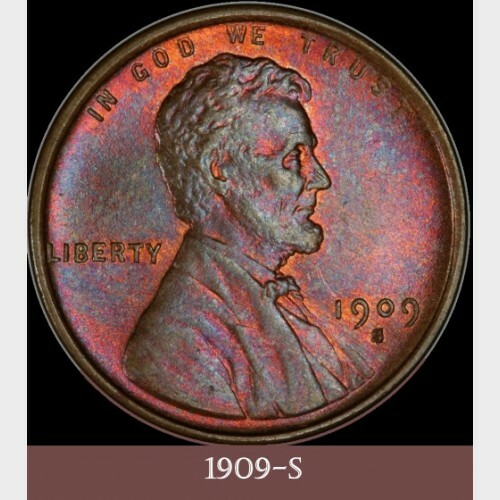 Much has been made of the “VDB” cents of 1909 that kicked off the longest running series of all United States coins. VDB, the monogram of Victor David Brenner, the designer of the Lincoln Cent, evokes a compelling story of brilliant artistry with an overlay of political intrigue that hopefully was well covered in the last Coins and Context article. 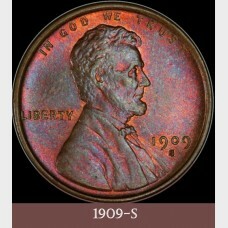 But – there were five more issues of the Lincoln cent that collectors have sought over the years with great vigor. The first of these, the 1909-S cent without the designer’s VDB, was produced immediately after the initials were removed. The San Francisco mint had produced far fewer VDB coins than Philadelphia, and likewise struck far fewer than the central mint of the coins without the VDB. Though collectors paid rather less attention to the “S no VDB” coin at the outset, over the ensuing decades the 1909-S has gained in stature, and value. The US Mint in Denver produced 1,193,000 cents – the third smallest mintage of all Lincoln Wheat Cents. But collectors of that time did not realize this, and few were put away when the coins were new. It wasn’t until two decades later that dealers and collectors began to realize that most 1914-D cents they encountered were well circulated coins, and that mint state coins were rarely seen. It was the San Francisco coins that received more attention in those years – perhaps an echo of the enthusiasm for 1909-S VDB cents! The other thing to know is that the 1914-D has been frequently counterfeited, either through alteration of other dated coins, or from castings made from genuine coins, usually in lower grades. 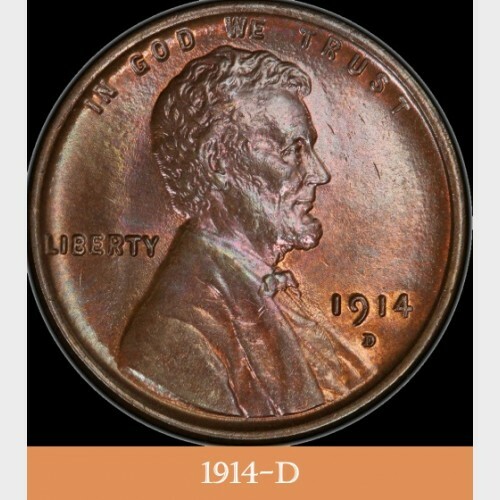 We strongly advise owners of 1914-D cents to have them professionally graded and certified. Production requirements for the three US Mints were a little different in 1922. The major requirement was to strike lots of silver dollars – and as you may know, the 1922 dollars are very common. In fact, there were no nickels, dimes, quarters, or halves struck at any of the mints that year. But cents were still needed, so it was decided that the Denver mint would be the sole producer of cents in 1922. 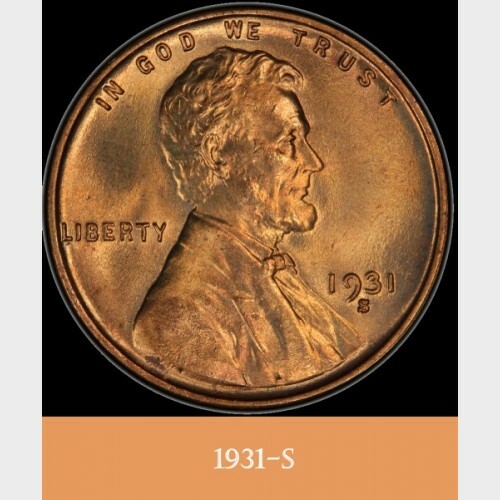 The 1922 cent production totaled 7 million pieces, which is the 16th lowest mintage of all Wheat Cents produced from 1909 through 1958. But at that point in time, at Denver, this was a tall order. Cent dies were in short supply, and what was on hand was heavily worn. As dies operated in the presses, an accumulation of oil, dirt, and metallic dust settled into the details of the die. This not only wore the die surfaces down more quickly, but also prevented a full striking of those details as the residue compacted and hardened under pressure. The remedy was to frequently clear this debris and polish the die surfaces. The weakly struck D’s and many of the omitted D’s can be traced to this cause. Both obverse and reverse dies tend to be weakly struck. 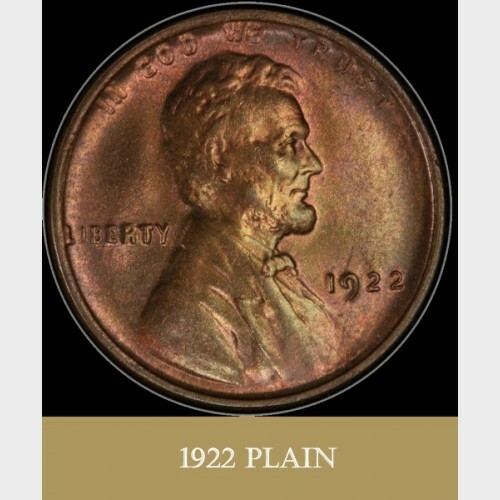 But the most desirable of the 1922 plain cents (no D whatsoever) resulted from the striking of one of the die pairs (Die Pair #2) striking at full force with no coin blanks in the press! This resulted in heavy damage to the reverse die which was immediately replaced with a newer die. (You know you have a 1922 plain from Die #2 because the reverse is strongly struck.) The obverse die, though well worn, was considered salvageable with repair and polishing. This was accomplished, but when the die polisher encountered the mangled mint mark on this die he just polished it off altogether. It is unclear whether this was overlooked by management in error or accepted as expedient to the demanding production requirement. At a total mintage of 866,000 coins, the 1931-S cent has the second to lowest mintage of all Wheat Cents. However, many have survived, including a substantial number of mint state specimens. The 1931-S was produced early in the year. 1931 was by many accounts the bottom of the Great Depression. The economy was sluggish in the extreme. Prices were going down as business declined. Though pennies were being pinched, they were not being spent! Consequently, much of the production wasn’t even released until 1935. It is thought that coin dealers and speculators may have snapped up a substantial portion of these uncirculated coins at that time. The relative abundance of the coin in mint state attests to this. Nevertheless, gem uncirculated (MS65 and above) are scarce, with prices to match. 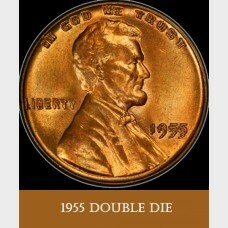 Near the end of the Wheat Cent series comes a truly spectacular doubling error. Little is subtle about this one, at least as far as the date and lettering on the obverse are concerned. In 1955 The Philadelphia Mint managed not to catch doubling details fully viewable without magnification. How this happened requires some understanding of the die making process, the quality control measures in place, as well as the requirement for a sudden increase in cent production mandated by a new one cent cigarette tax. Dies are the result of a process that begins when a coin design is first executed by the designer in plaster. The mechanical reduction of this to a steel Master Hub gets the design to the scale of the coins to be produced. Next, Master dies are produced as impressions of the Master Hub. Multiple Working Hubs are made from the Master Dies. The actual coin dies are made from two impressions of from the Working Hubs. Two impressions are required to produce coin dies that will strike the design sharply into the coin-to-be. In the case of the 1955 doubling, the two impressions were not perfectly aligned. The photos indicate just how far off they were! Although up to seven people had oversite for quality control, no one caught the error. Apparently, the urgency of the production schedule to meet the needs of the cigarette tax meant that coin production extended to a “graveyard” shift from midnight to 8 AM on the day the 1955 double die obverse coins were minted. When the Chief Coiner arrived in the morning an assistant showed him an example of the doubled die coins. The overnight production was already loaded on trucks for distribution. It was decided that the 20,000 or so double die cents were not worth holding up the shipment of several million pieces. Because awareness of this coin was front and center from the outset, most are found in XF or above condition.